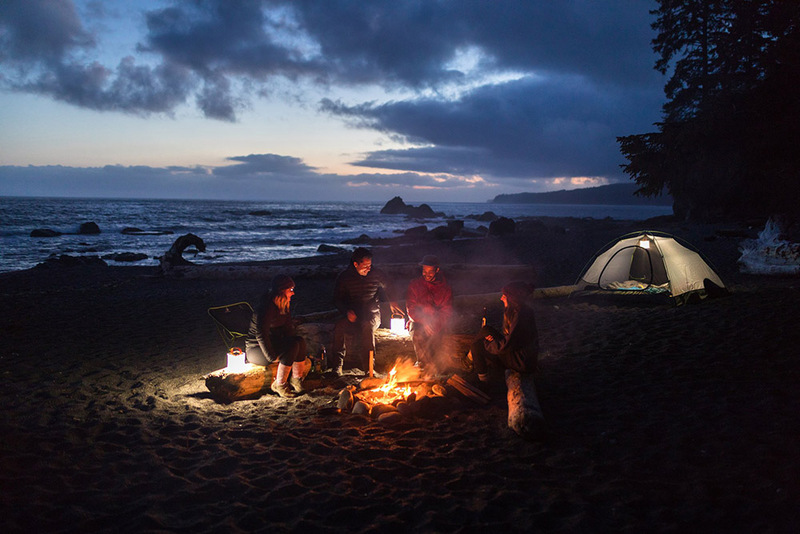 Abstract: LuminAID inflatable solar LED lantern lights with USB device charging functionality reduce weight and volume to a minimum for unprecedented portability while offering dependable light and power for all your outdoor adventures. Extremely compact and lightweight, the LuminAID PackLite Hero inflatable solar lantern doesn't add bulk to your pack but brings you tremendous convenience. 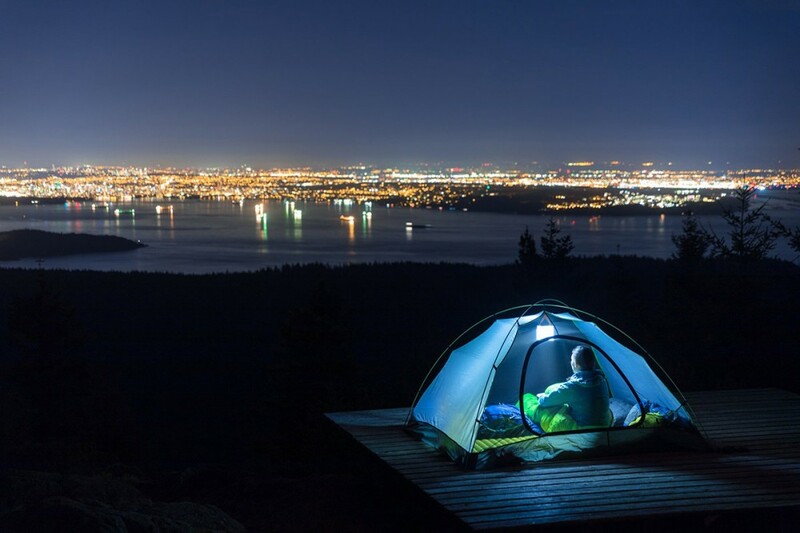 Capable of providing bright illumination and backup power for your electronic devices virtually anywhere, this 2-in-1 travel companion is nothing short of essential for camping, traveling, and emergency lighting. No matter what adventure you have planned, PackLite takes light and power on the go with ease to meet your active lifestyle. 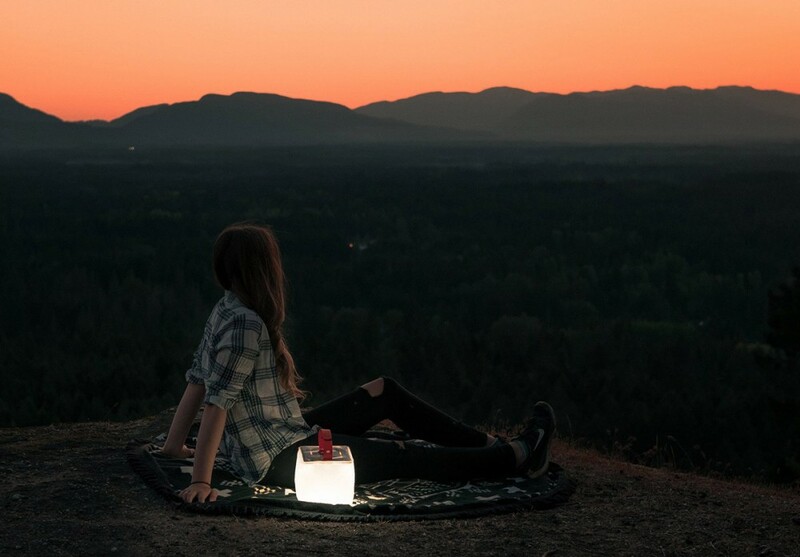 The collapsible lantern allows you to escape the messy wiring requirements of electrical accessories and alleviates you of the burden to carry a cumbersome, heavy camping lantern. The PackLite Hero solar lantern weighs 9.4 ounces or 266 grams, just one third of a conventional solar lantern. When inflated the lantern converts to a cube and stands 6 inches tall. It deflates to less than 1 inch flat, transforming into world's most compact lantern that can be easily carried and stored. PackLite's portability is reinforced with the Lycra strap and carabiner loops. The Lycra strap with Velcro fastenings creates a secure clasp that allows the PackLite Hero to stay firmly attached to your backpack even when the lantern bounces up and down in the course of hiking, jogging, or other activities involving continuous movement. The Velcro fastenings provide more freedom of movement for setting the length and offer effortless operability for children and other users who may have difficulty with the dexterity required to close plastic straps. The PackLite Hero has two small holes on either strap the exact size to thread a carabiner through, allowing two carabiner loops to integrate easily with your gear. Plus, the Lycra fabric of the handle is designed to survive the wear and tear from the carabiner loops. Just because PackLite was designed to provide the ultimate in portability, it doesn't mean that its illumination performance has to be compromised. The LED lantern is capable of producing up to 300 lumens of bright white light. Impressive light output translates to a massive light coverage of 300 square feet. The LED module runs on a 4000 mAh rechargeable battery which provides 3-5 hours of straight burn time on the Turbo mode (100% light output), 8-10 hours on the High mode (150 lumens), 14-16 hours on the Medium mode (75 lumens), 72-100 hours on the Low mode (10 lumens) and 100+ hours on the SOS emergency mode on a single charge. The SMD LEDs are overmolded with polycarbonate lenses which diffuse LED hot spots and distribute light uniformly. In combination with the TPU (thermoplastic polyurethane) shade that provides the optimum balance of light diffusion and light transmission, PackLite delivers visually comfortable illumination which completely eliminates glare from every angle of view. Getting out into the deep wilderness doesn't imply that you have to leave behind your digital gadgets simply because there's no AC power to get them recharged when they will run out of power. 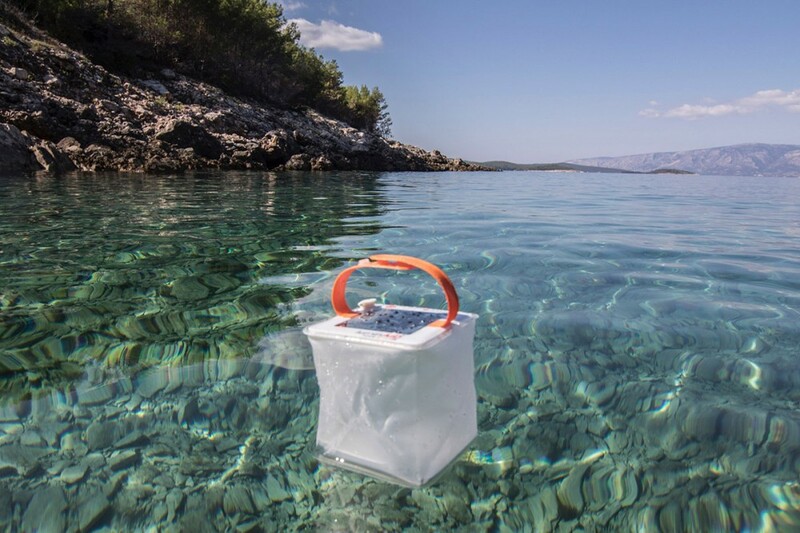 The multi-function solar lantern comes with a USB port that enables you to conveniently charge smartphones, tablets, cameras, and other electronic devices without the need of an outlet. When acting as a power bank (5V 2 Amp output) the rechargeable battery pack provides up to two full charges for a smartphone or digital camera, up to 60% power for a tablet, and two or three full charges for headlamps. The PackLite Hero features a dual charging system which allows you to switch between solar power and computer power. 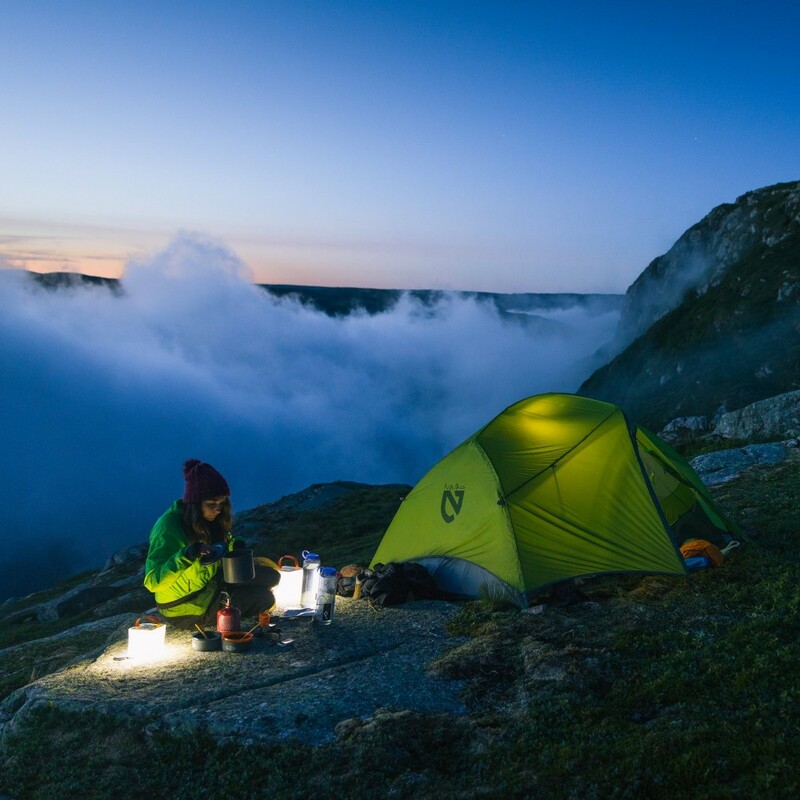 When you're in the great outdoors either place the lantern outside of your tent or hang it on your backpack so as to allow the integrated solar panel to harvest energy from sunlight. It takes approximately 16 hours of direct sunlight exposure to fully charge the battery. The LED lantern has a micro-USB input port which allows you to get the battery charged in less than 4 hours by plugging into a computer USB port or a 5V USB wall outlet adapter. 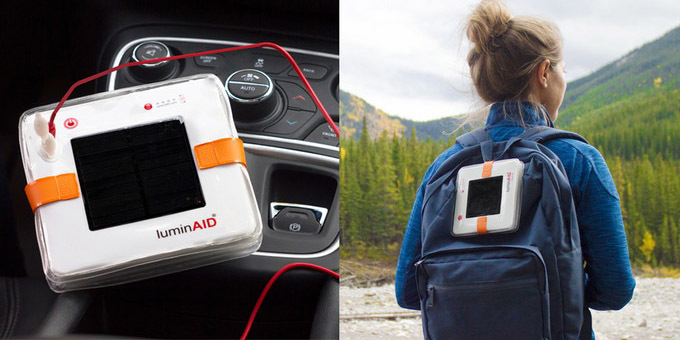 LuminAID lanterns have a solar indicator which shines red when the solar panel is exposed to light. A battery charge indicator composed of 4 LEDs is programmed to light up when the battery is within a specified voltage range. The solar lantern incorporates components that sets the industry's benchmarks for performance, efficiency and reliability. The light source delivers high luminous efficacy and flux density over an L70 lifespan of up to 100,000 hours. The PackLite Hero is equipped with a high-efficiency SunPower monocrystalline solar panel which uses an advanced surface texturing process to increase light absorption and gets the battery partially charged even in low-light conditions. The lithium-ion polymer battery is made to tolerate deep discharging and allows over 1000 charge/discharge cycles even with fast charging. It performs at 100% for 500+ charges and operates at 90% performance for another 500+ charges. Built-in electronic circuitry provides tight regulation of battery charging, load control and lighting control. With a passion for quality and perfection, the product has been engineered to the last detail. LuminAID lanterns have wide seams where the molds of the expandable frame come together and are secured. This makes the lantern more durable, without causing small, hard to notice slips in the seams that could lead to deflation over time. The USB port has a casing all the way around to maintain the lifetime integrity of the waterproofing cover. A small "pie slice" shaped hole on the interior of the valve provides ease of inflation and deflation without having to struggle with pinching or pulling on the valve. The lantern is built to provide IP67 level ingress protection, which means PackLite could be your most loyal companion for virtually all your outdoor adventures - be it camping, hunting, hiking, backpacking, cycling, climbing in rainy days or humid environments, or fishing, boating, lakeside picnicking and other activities which require the lantern to resist unavoidable water invasion. The PackLite Hero uses optically optimized and eco-friendly shade material to lead the way in green initiatives. The durable and weather-resistant TPU shade is 100% PVC-free. PVC (polyvinyl chloride) is a type of halogenated plastic that contains two known human carcinogens: vinyl chloride and dioxin. Vinyl chloride is strongly associated with liver cancer (hepatic angiosarcoma), brain and lung cancers, lymphoma, and leukemia. Dioxin is believed to intensify the effects of other toxic chemicals and cause cancer, reproductive and developmental problems. TPU does not produce or contain lead, dioxin, phthalates, or any other poisons. The use of non-toxic plastic eliminates health concerns, allowing the lantern to be safely inflated with direct contact to the plastic valve.